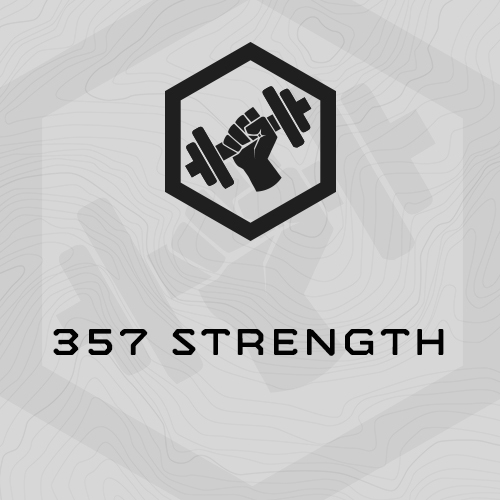 357 Strength combines the proven strength training methodology we’ve developed at Strong Swift Durable, with the hormonal release theory experienced by CrossFitters. Heavy strength is followed by complementary, short, intense, work capacity efforts designed to follow up the max effort, central nervous system focused strength training with a complementary hormonal release. 357 Strength is one of our most successful strength training programs, and also one of our most fun. We originally designed it to prepare one of our former “lab rats” and now a gym owner himself, Josh Rempel, for the 2011 Crossfit Games. The overwhelming focus of this plan is strength, but it also includes short, intense, work capacity efforts, as well as high emphasis on core strength strength, mobility, and durability – hallmarks of our programming. Similar to TLU strength progression, 357 Strength works through a 1RM and 85% 1RM for the working sets of the first heavy portion. It’s followed by a moderate load “hard but doable” effort. The key to 357 Strength is the complimentary work capacity effort. Varying in duration from 3 minutes, 5 minutes, to 7 minutes, these work caps utilize the same exercises conducted in the strength portion to create a “hormonal flush.” This shocks the body to overcompensate during recovery, resulting in greater gains than if the exercises were completed in the same volume, but with less intensity. 357 Strength is one of just 6 MTI Strength Programming Methodologies. Read more HERE. We most recently updated this plan in December, 2016. You will train 5 days/week for a total of 30 training sessions. The intention is that Monday through Friday are are training days. Saturday and Sunday are rest days. Everyday but Wednesday you’ll train both strength, and a short, intense, work capacity effort. Wednesdays’ training sessions are an unload, moderately paced stamina effort. This is Version 3 of the plan, Updated in December, 2016. Anyone who wants to dedicate 6 weeks to building strength. We’ve deployed 357 programming with Special Forces, professional mountain athletes, office workers and high school sports teams. It’s awesome strength programming! How long should I rest between Rounds and Circuits? The strength circuits each have stretch or durability exercise. Consider this your rest between rounds. There is no- rest between circuits more then what is required to change equipment and load barbells. Understand the strength circuits not mini CrossFit-like WODs. Work briskly, not frantically. All sessions but Wednesdays include a short, but intense work capacity effort. Some of these are “for time” – and will be noted. Others are density or interval training. For these efforts, “sprint” to the rest in each round. - Fully equipped functional fitness gym including barbells, bumpers, racks, plyo boxes, etc.